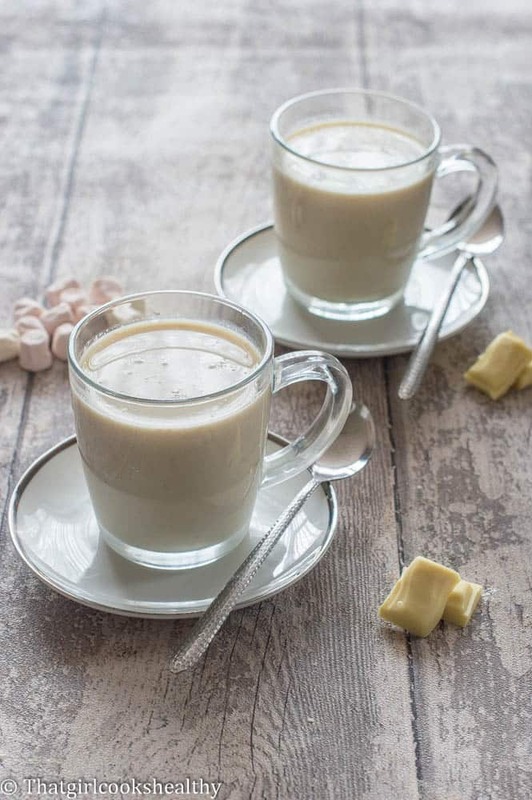 Learn how to make delicious vegan style white hot chocolate within a matter of minutes using raw cocoa butter, almond milk, vanilla and nutmeg. I’m so excited to share this white hot chocolate recipe with you all. It’s a recipe that can be made within a matter of minutes and one that will take you through the entire course of the winter period with a smile on your face. 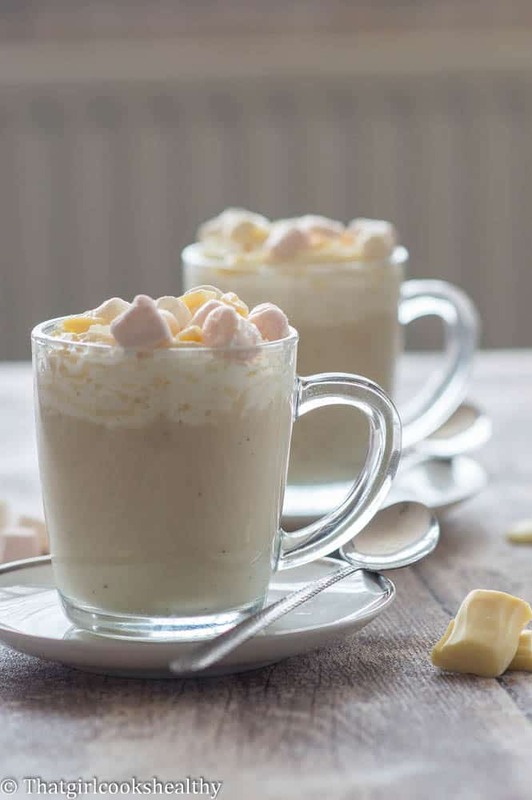 This is nothing but creamy, delicious, luxury white hot chocolate in one serving. When most people talk about “hot chocolate” they immediately think of the dark hue. Granted I am partial to the former type of hot beverage. If you’ve navigated my website you will see a few of my favourite drinks including my cherry hot chocolate and my orange hot chocolate .Those are just two examples of chocolate drinks that myself and my fellow readers seem to enjoy the most. Sometimes it’s nice to switch things up from what is considered the norm. 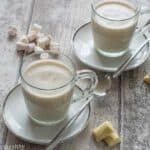 Dark hot chocolate (albeit vegan/dairy free) is wonderful but this white hot chocolate recipe really takes things up a notch. 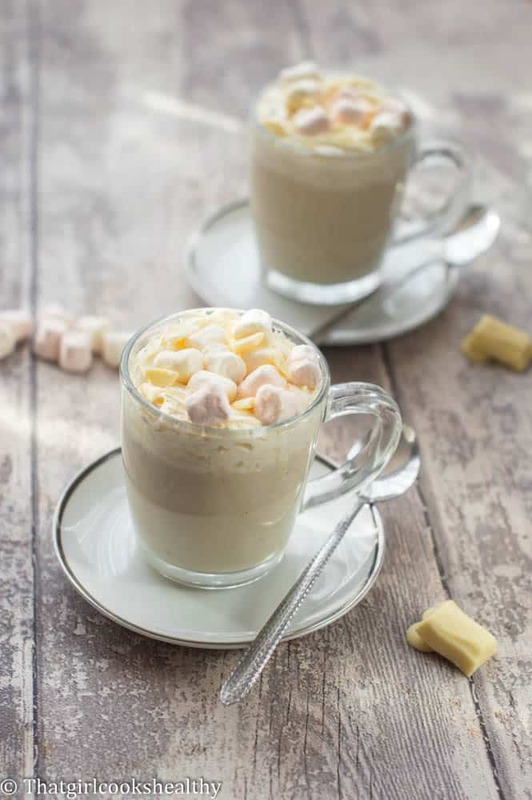 The recipe for white hot chocolate is very simple and easy to pull together. In order to make this drink dairy free/vegan, you will need some cocoa butter. Raw cocoa is vegetable fat extracted from the coco bean to make chocolate. Now we have touched on the important ingredients, let’s discuss the method. The milk – you can use any plant based milk to make this drink. I tried coconut milk and then almond and cashew which is expensive. In the end, I settled with almond milk because it was cheaper than cashew and taste isn’t overpowering like coconut milk is. Cashew nuts – I found adding a small amount of cashew nuts made the milk more creamy. This is an optional step so if you don’t have any cashews to hand, it’s not a dealbreaker. Sweetener and spice – coconut nectar is my preferred low GI sweetener. The nutmeg and vanilla add a hint of flavour. These ingredients are added once the cocoa butter is melted and stirred in. 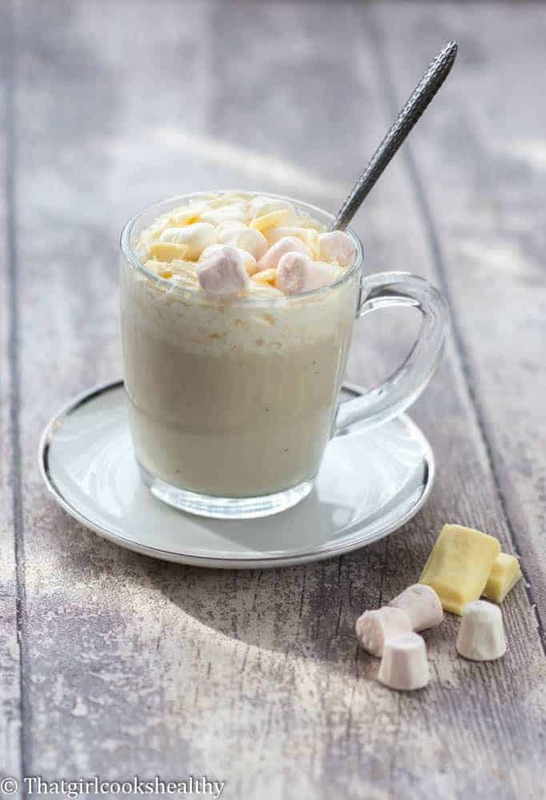 The topping – you can serve the drink neat without a topping or with dairy free cream and marshmallows. Again this is purely your choice and not mandatory. Can I make this white hot chocolate fat free? Yes, you can use light coconut milk if you are concerned about the fat content. Add the cashew nuts to the almond milk and blitz in a blender then pour the contents into a saucepan. Finally add the vanilla and nutmeg to the saucepan giving another stir prior to serving. Pour the almond milk with the cashew nuts into a blender and blitz until smooth. Serve alone or with optional topping – cream and marshmallows.